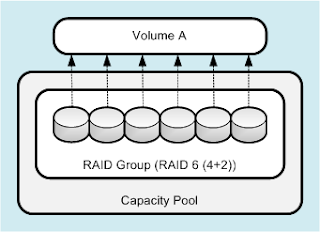 Additional volumes could be created assuming there is capacity in the pool and would also be striped across the disks in the RAID Group. Since the original installation, we have added a couple of expansion trays and now have a total of 24 NL-SAS disks. 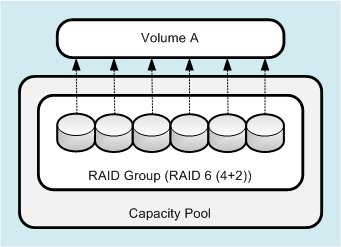 The VNXe has configured three extra RAID6 (4+2) Groups, but does not automatically rebalance existing volumes across all the RAID Groups in the pool. A further complication may arise if the first volume created completely filled the RAID Group. In this instance, the VNXe will not be able to use the first six disks and the second volume will be striped across 18 disks. Unfortunately, because the VNXe is "simplified", it's not possible to see this from the Unisphere web interface. EMC seem to assume that the only metric non-storage specialists care about is capacity. Not true! # Show disk info, based on wwns from RG. What do you do if you find yourself unable to take advantage of all your RAID Groups? As mentioned above, the VNXe does not auto balance existing volumes when new disks are added. The only way to take advantage of the new disks is to create a new volume, copy everything across and delete the original. Not ideal. Even the VNXe's bigger sibling, the VNX, had this limitation until the recent "Inyo" release. Hopefully, the new auto balance feature will trickle down and appear in a future VNXe update. I think as it stands, the current VNXe Unisphere is too simple. While I'm glad that the VNXe hides the FLARE LUNs and DART dvols, slices, stripes, metas etc from the user, it needs to go further in showing where a volume is going to be placed and what performance can be expected. This is something that even non-storage admins care about!